Double donor parents seek third kidney Jump to media player Joanne and Mark Wishick are thought to be the first in the UK to each give kidneys to their children. 'I placed ad for kidney donor' Jump to media player A woman who found a kidney donor after placing an advertisement in her local paper has been speaking about her appeal. 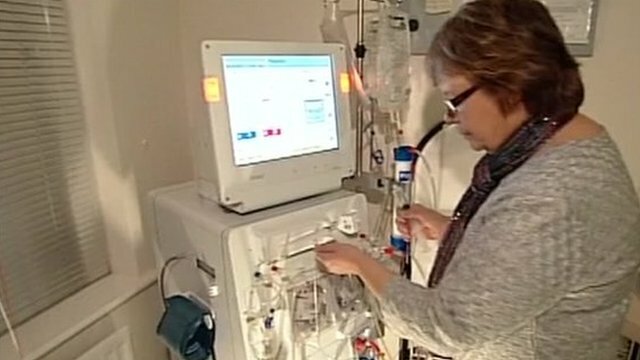 Life waiting for a kidney donor Jump to media player A record number of organ transplants took place in the UK last year, but the NHS says there is still a long waiting list. UK's oldest living kidney donor Jump to media player Nicholas Crace, the 83-year-old who has become the oldest person in the UK to donate a kidney while still being alive, told BBC Breakfast why he decided to donate so late in life. Parents who donated kidneys to two of their children are searching for a third donor because one of the organs is failing. Joanne and Mark Wishick, from Leigh-on-Sea, in Essex, are believed to be the first in the UK to have each given kidneys to their children, who were born with chronic kidney failure. In 2005, Mr Wishick donated to their then two-year-old son Oliver, but 19-year-old Ella's kidney, donated by Mrs Wishick in 2012, is failing. She needs a replacement but, failing that, the family are also raising money for an extension to their home to build a sterile room where she can have dialysis.